New Delhi, 20 July 2017: The Government has received proposal to make Patriots Day, observed on 13th August, and Ningol Chakkouba, which coincides with Bhai Duj, as restricted holidays and include them in the National Calendar. 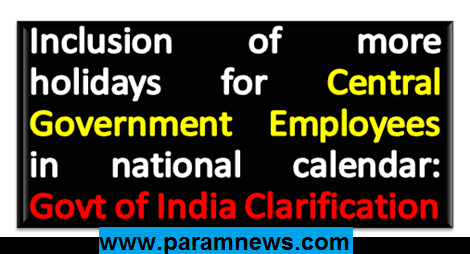 As per policy, the Central Government Employees Welfare Coordination Committee in the State Capitals choose three holidays keeping in view the occasions of local importance. The Coordination Committees at the State Capitals may draw up separate list of Restricted Holidays keeping in view the occasions of local importance. This was stated by the Minister of State (Independent Charge) for Development of North Eastern Region (DoNER), MoS PMO, Personnel, Public Grievances, Pensions, Atomic Energy and Space, Dr. Jitendra Singh in a written reply to a question by Shri K. Bhabananda Singh in the Rajya Sabha today. As per existing policy, the Central Government administrative offices observe 17 holidays in a year. Out of these 17 holidays, 14 are pre-notified, compulsory holidays, which include three National holidays, namely, Republic Day, Independence Day and Mahatma Gandhi’s birthday.